Leonardo da Vinci is remembered in history as a “universal genius”, he was an artist, a scientist, a mathematician and an engineer. He generated a huge amount of ideas and sketches of revolutionary concepts in his days. Although, almost none of these became reality. Why was it like that? What is the reason that brilliant ideas don’t become innovations – in hands of the users? Research teaches us that the path from idea generation to successful product implementation is long and sprinkled with challenges. Innovative ideas are by nature affected by opinions, assumptions and feelings about how a system should work or about what will be the best solution. Back in Leonardo’s days no quick method to test concepts existed, and the process of manually building several prototypes in a trial and error mode was too expensive and time consuming. Today – 500 hundred years after the Florentine renaissance “universal geniuses” are replaced by multi-disciplinary project teams. But, the challenge of evaluating concepts before committing time and money is still unsolved. Surely well-established design process with broadly adopted methods and tools have radically impacted the way an engineer approaches a development activity, and has revolutionised the way people create new products. Although, when very early design concepts are selected it is still the intuition, experience and subjective assessment of the people involved that play the biggest role. But something is changing, and it can be the dawn of a revolution in the way concepts development is approached. Digitalization has quickly and inexorably invaded almost all the fields of our existence, bringing societal benefit unprecedented in the history of mankind. Information communication technologies have revolutionised lifestyles, global interaction and industrial working practices. Companies are nowadays capable of collecting data potentially on any product lifecycle activity and performance. Smart devices and sensors are used to monitor performance, predict failure and run preventive maintenance, or to monitor the health condition of a user to prevent incidents. GPS data are used to define the optimal path from one point to another or to manage a whole fleet of vehicles to move accordingly to the best optimal results. 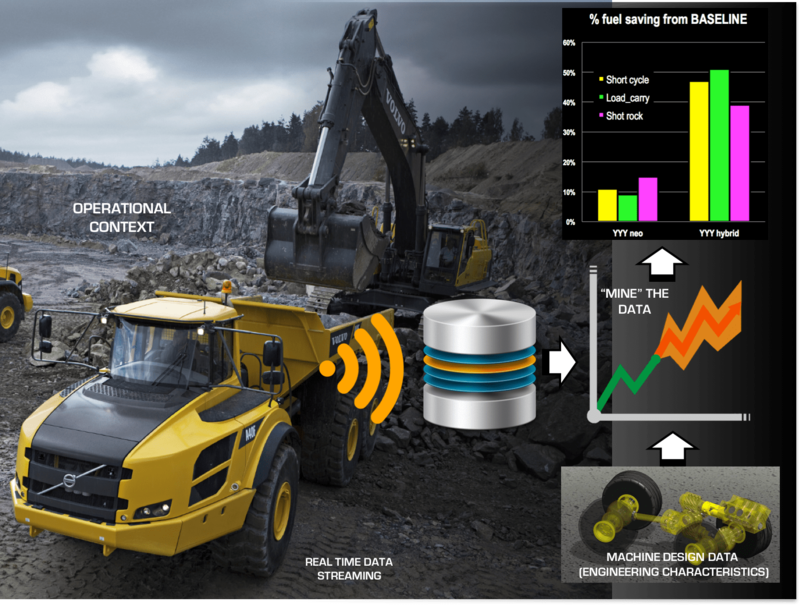 Connected autonomous cars and construction equipment are on their way, with live prototypes out there, only awaiting legislation, and yet another design iteration. Despite the big amount of data available there is no established practice to use this data for product development. A huge source of data is available but not used for concept selection, or engineering design. The research challenge is therefore to transform product operational data into useful knowledge for engineers so that decisions made on experience and intuition can be supported by real facts about the expected value of a new design concept. Unspoken needs, estimated performances, impact of contextual condition on product operations, shall be able to be systematically derived thanks to the available stream of data constantly recorded, rather than qualitatively assessed by expert. 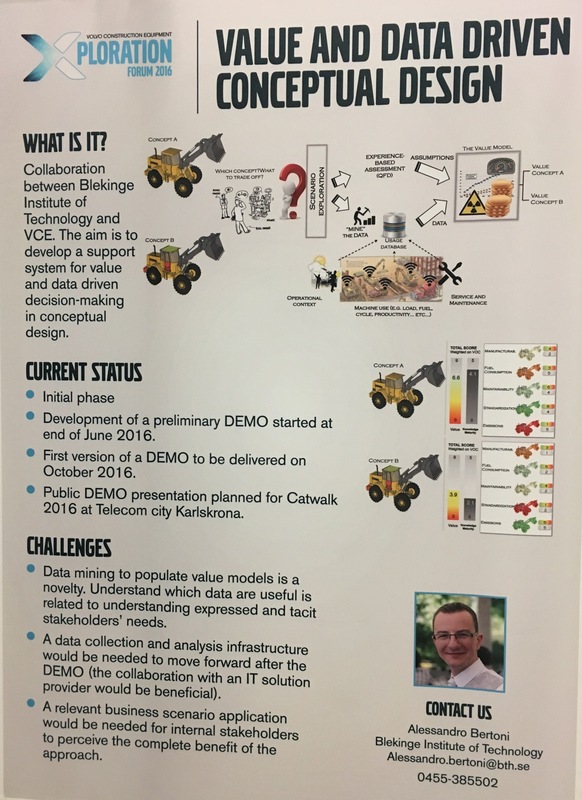 This research challenge has been the focus of a demonstrator developed in collaboration between Blekinge Institute of Technology and Volvo Construction Equipment (within the research profile model driven development and decision support). The demonstrator made use of machine learning techniques applied on operational data from machines and it generated mathematical models representing the impact of different contextual variables on the performance of a machine. 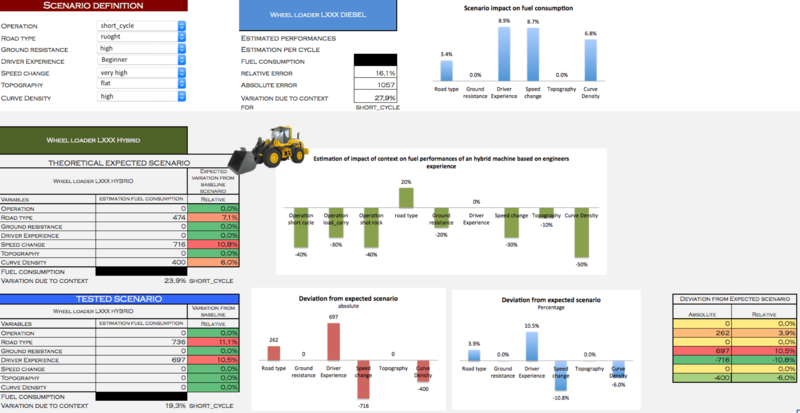 The fuel consumption of a machine was forecasted and visualized, highlighting which contextual variables had a correlation with it and quantifying, for instance, the forecasted increase of consumption based on the experience of a driver or on the topography of a working site. 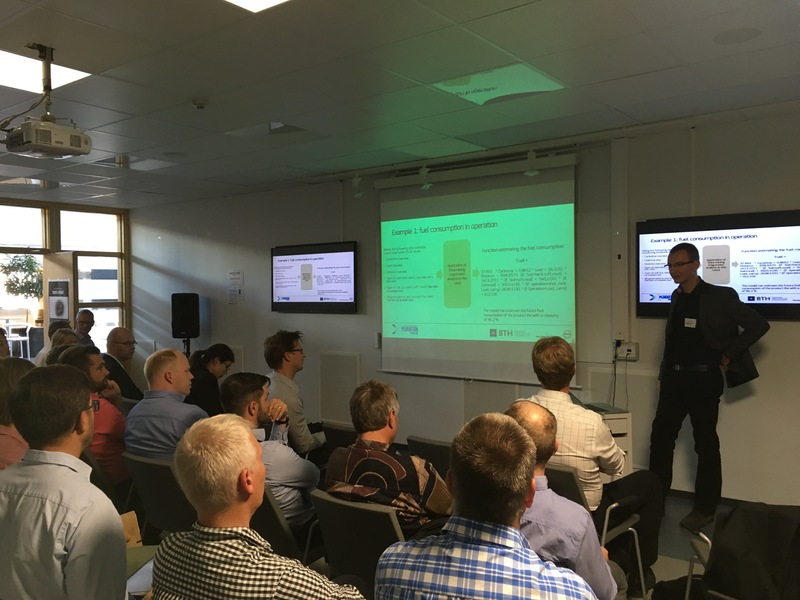 The demonstrator provided an intuitive visualization interface where engineers could play with the data and quickly test and forecast the performance of a future product, relying estimation from factual data rather than on opinions. Despite applied in a small-scale example, the work demonstrates the high potential of integrating data science algorithm in the ever-changing product development process. This will help reducing the gap from brilliant ideas to real products in the hands of the customers, and ease the way into future solutions, like the autonomous HX01 concept. 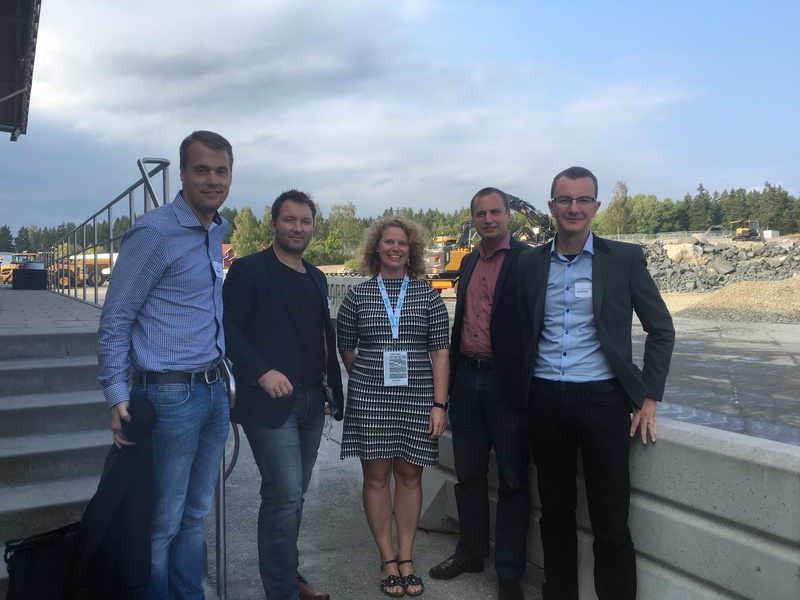 The research team of Christian Johansson (BTH), Tobias Larsson (BTH), Jenny Elfsberg (Director, Emerging Technologies, VCE), Peter Wallin (Chairman of BTH research profile, VCE) and Alessandro Bertoni (BTH) at VCE site in Eskilstuna. For more information, contact Alessandro Bertoni (alessandro.bertoni@bth.se), or Professor Tobias Larsson (tlr@bth.se).